After the 1991 season it became clear that Minardi could not afford another year with Ferrari power, so the team made the switch to Lamborghini. 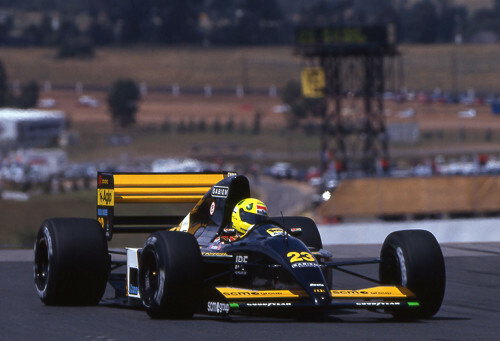 Minardi had to let Pierluigi Martini go that year, replacing him with Brazilian F3000 champion Christian Fittipaldi, who lined up alongside Gianni Morbidelli. Morbidelli had already raced with Minardi during the previous season and had won the first point of his career with Ferrari at the final event of 1991. The team competed with the old car in the first overseas races, while the new car was ready at Imola. While reliability was an issue througout the season, Morbidelli came in seventh at Interlagos, just shy of a championship point. With the arrival of the new car, Minardi's qualifying performances sharply improved. Morbidelli put the car on a 12th spot on the grid at Monaco and a 13th spot in Canada, but the team struggled to make the car go the distance during the race. Making matters worse, Fittipaldi hit the wall at Magny Cours and broke his vertebrae ruling him out for two months. Italian Alessandro Zanardi was called in to replace the Brazilian but failed to qualify the car in two out of three appearances. Fittipaldi returned but was still weakened by the accident and equally failed to qualify twice. Only slowly the Brazilian recovered and the team put up a respectable performance at the Japanese Grand Prix, with Morbidelli qualifying 14th and Fittipaldi outpacing him to take 12th. During the race, Fittipaldi took the team's only point that season, coming in 6th. 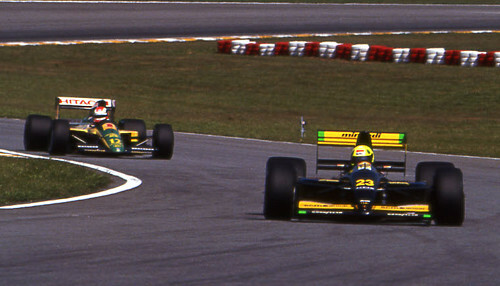 Morbidelli left the team at the end of the season, while Fittipaldi would stay on for another, quite successful, season.